As a child, some of my favorite books to read were from the Give Yourself Goosebumps choose your own adventure series written by R.L. Stein. Throughout each book, there were several opportunities for the reader to exert some agency. If you wanted your character to walk through a door, you’d turn to page 78. And if you wanted the character to turn and run, you’d turn to page 52. Depending on the series of choices you made, the story could be slightly or drastically different every time you read it. I loved those books and others like them because it drew me into the process, begged me to be an active participant rather than just a consumer. What I didn’t realize at the time was that the choose your own adventure concept would be a perfect metaphor for navigating life. We can either be passive consumers of our experiences or we can actively shape the story. Every day we make hundreds, perhaps thousands, of tiny and massive decisions that shape our own story. Turn here, eat this, accept that job offer. Each one has the potential to lead us down a slightly different path. Here’s the catch….in life, we already know the end of our story. We all meet the same ending so the question becomes, what do we want to do along the journey? 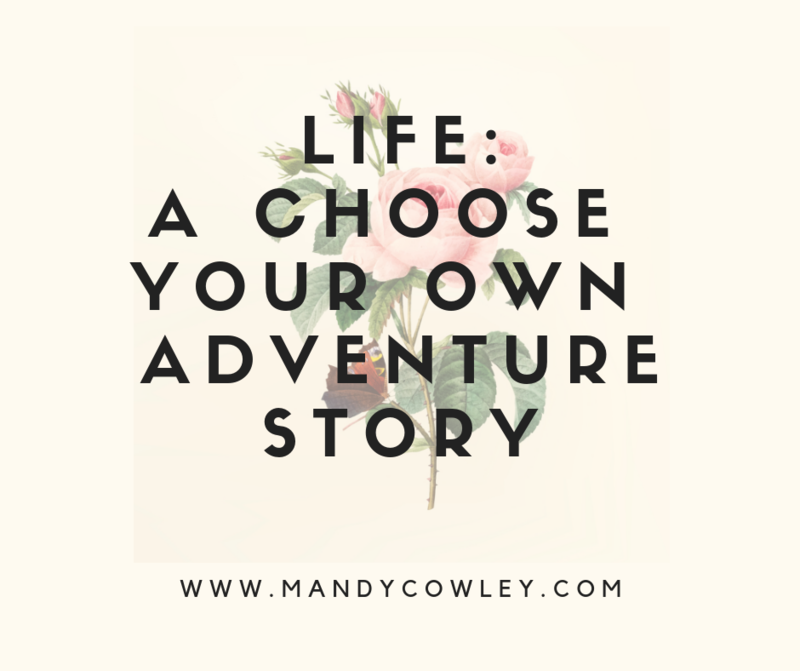 We cannot always control the outcome of our decisions, and much like the choose your own adventure books, sometimes life throws us an unexpected twist, but we can live with intention, with an idea of what we’d like to experience on the way, and we can control how we react to those unexpected twists. Every morning I try to meditate on a single word that I hope to carry into my day. Grace. Humility. Boldness. It’s amazing how thinking about that one simple concept for even just a few moments can shift how I interact with the world. I am intensely curious about myself and carve out plenty of time for self reflection. If you don’t know what your hopes, fears, desires, motivations, pitfalls, hangups, etc are…how can you live with intention? You will spend your life in a reactionary state, motivated by things within you that you do not understand. I have a vision for the legacy I want to leave. I periodically reflect on the statement “Because of me, my son will know __________________”. What am I teaching him about the world? What is most important for him to understand? What will he say about me when I am gone? Knowing how I want to fill in that blank gives me guidance on how I navigate relationships, how I spend my time/money/energy. It is a filter through which I can run every decision. How does this help build the legacy I hope to leave? I know some areas where I want to have an impact, some social problems I want to draw attention to. I cannot do all of the things, so where can I be most effective? These questions have led me to my most exciting opportunities and have kept me from spending too much time and energy on perfectly fine things that would keep me from having the strongest impact possible in a few select areas. Your life is going to have an impact, but you get to decide whether that’s an intentional impact or a haphazard one. Meditation. I can’t tell you how much meditation has changed my life and how much better my whole experience is when my meditation practice is healthy. Sitting still is hard. Quieting your mind is hard. There are so many lessons to be learned in that stillness that we carry into the chaos. Are you living with intention, actively and purposefully shaping your own story? Or are you just a consumer of it, turning the page to find out what comes next? Parker Palmer's A Hidden Wholeness: The Journey Toward the Undivided Life begins with this story: "There was a time when farmers on the Great Plains, at the first sign of a blizzard, would run a rope from the back door out to the barn. They all knew stories of people who had wandered off and frozen to death, having lost sight of home in a whiteout while still in their own backyards". I worry that in a culture that constantly encourages us to do more, be more, and have more that we sometimes wander out into our own metaphorical backyards, chasing the things we think we need to be happy, or mindlessly moving with the wind, and lose sight of our way home, back to people and things that give us life. I am in the midst of my own reckoning. I am learning to let go of what it is I am "supposed to be", putting down the broken mirrors all around me that are giving me a distorted view of myself and my life, and trying to find my own way. I am slowly finding my way back in from the blizzard, from the do more/be more/have more hustle, and I am laying a rope for the times I will inevitably find myself out in the chaos. I hope you'll join me.